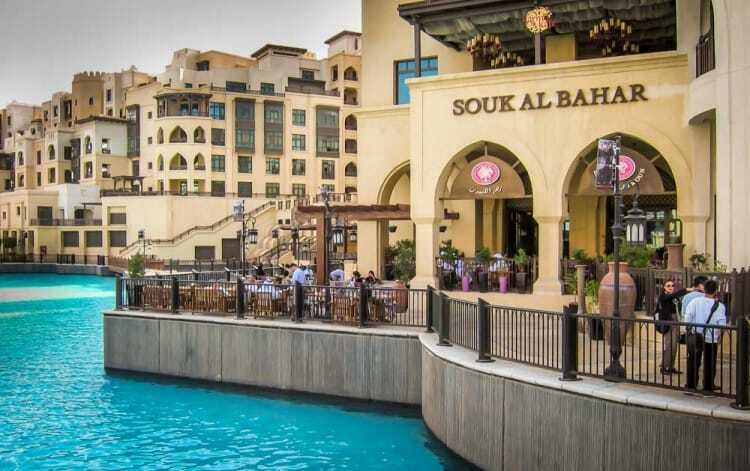 Souk Al Bahar is a modern Arabian souk on the Old Town Island at Emaar’s massive Downtown Dubai development. It offers a small number of stores selling mainly handicrafts, carpets, antiques, and souvenirs. 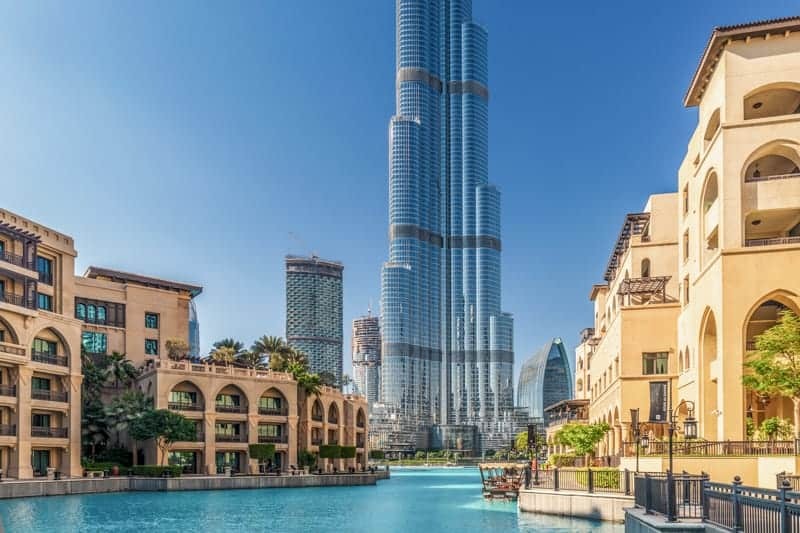 The main attraction though is its strong collection of restaurants and cafes, many of which have great views of the Dubai Fountain and Burj Khalifa. 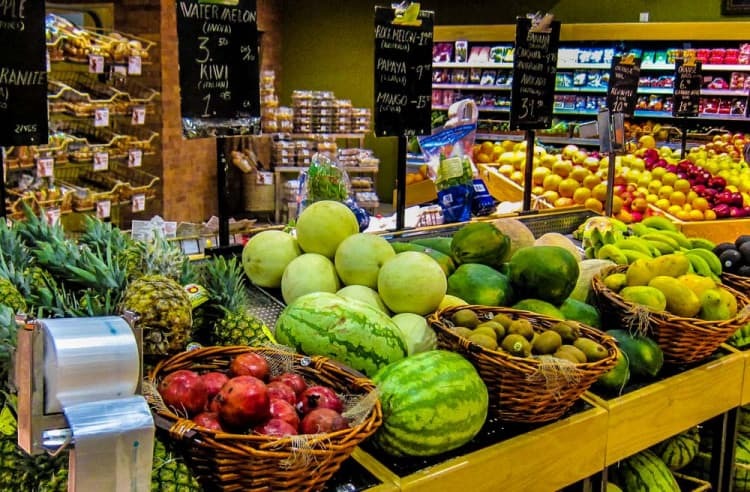 Shops at Souk Al Bahar are listed below. Al Jaber Gallery – Antiques, arts and crafts, carpets, souvenirs, etc. Al Rifai – Nuts and confectionery. Bait Al Kandora – Arabic clothes, sandals, and accessories for men. Bateel – Gourmet dates, chocolates, truffles etc. Camel Company – Gifts and souvenirs (mugs, t-shirts, postcards, stationery etc.). Emad Carpet Trading – Hand and loom-woven carpets from Afghanistan, Iran, Pakistan, India and elsewhere. Gallery One – Original art, fine art photography, gifts, and stationery. Intermix Gems – Jewellery store. Kids Zone – Play and activity centre. Mehreen Carpets – Persian carpets. Melange – Vibrant ethnic clothing for women. Mozaiic Art Gallery – Original and limited edition prints. Primavera – Dry cleaning and laundry. Ramonda – Women’s clothing, lingerie, and fashion accessories. Regional Trading – Pakistani shawls. The Custom Shop – Men’s tailors. Yas Beauty Spa – Hair and beauty salon. The Camel Company offers a massive range of stuffed toy camels plus lots of other gifts such as camel t-shirts, camel drink stirrers, keychains, notepads, fridge magnets, calendars, and more. Bateel is one of the best places in the city to buy gourmet dates and over 20 different varieties are available. The shop also sells quality chocolates, chocolate dates, date biscuits and cookies, Turkish delights, dried figs and apricots, nuts, nougat, jams and honey, mustard, and olive oil. The Souk al Bahar offers a great selection of restaurants and cafes. Unlike the restaurants at the nearby Dubai Mall, many of them are licensed to serve alcohol. Options include Abd El Wahab (Lebanese), Bice Mare (Italian – licensed), Karma Kafe (International – licensed), and The Meat Co. (Steakhouse – licensed). 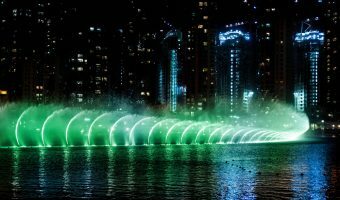 Many of the restaurants also boast outdoor dining areas with great views of the Dubai Fountain. The walkways around Souk Al Bahar also offer good views of the Dubai Fountain and are far less crowded than those around the Dubai Mall. Facilities include a customer service desk, toilets, baby changing areas, and ATMs. Souk al Bahar is situated on the Old Town Island at Downtown Dubai. 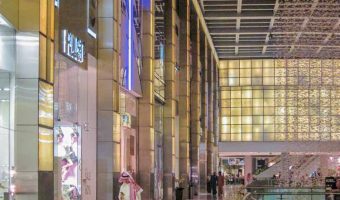 It is just a short walk from the Dubai Mall (across the Burj Khalifa Lake via the Souk al Bahar Bridge). Shoppers travelling by car arriving by car should leave Sheikh Zayed Road at Interchange 1 and take Financial Centre Road (previously Doha Street), following the signs for the Palace Hotel. The car park is right next to the hotel entrance. Visitors can also park at the Dubai Mall. The closest Metro station is the Burj Khalifa Metro Station on the Red Line. Feeder buses depart from the station and go to Downtown Dubai. It’s also possible to walk to Souk al Bahar from the Metro station in about 10 minutes. Bus service 27 leaves from the Gold Souk Bus Station in Deira and goes to Downtown Dubai. Map showing location of Souk Al Bahar. Huge mall with over 1,000 stores including Bloomingdale’s, Galeries Lafayette, Waitrose, and Hamleys. Also boasts a huge selection of restaurants, an ice skating rink, an aquarium, 26-screen cinema, and children’s ‘edutainment’ centre. Claims to be the world’s largest musical fountain. Performances are held throughout the day and it’s free to watch. 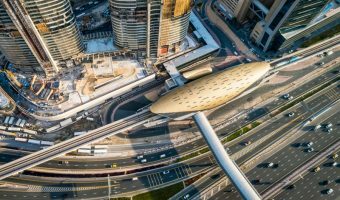 Guide to Burj Khalifa/Dubai Mall Metro Station. 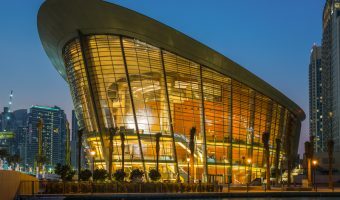 Guide to the Dubai Opera. Includes a list of upcoming shows and events, ticket information, location map, and details of how to get there.